Gone bingo members will enjoy all of the offers that this bingo gaming network provides. If you are wondering what site is fun, you may want to try Gone Bingo! Launched in December of 2012, it’s very popular, and the homepage is bright, informative, and expansive. Unfortunately, compared to other bingo networks, there might not be enough pizzazz on the home pages for some. Still, you’ll find what you need when you’re playing, and have lots of jackpots and special promos that give you the best chances possible to win. This website is operated by Cozy Games Management Limited, and is registered in Isle of Man. Cozy Games was established in 2005. They certify that the random number generators used are fair, and the software has been tested by iTech Labs and eCOGRA. There are tonnes of welcome offers and bonus codes available on the site in April 2019. If you are interested in checking out what is in store for you, please sign up today. 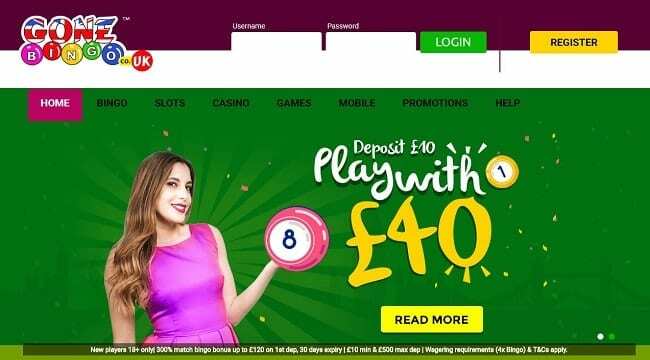 Check out our Marina’s Bingo review to see another site with a similar welcome offer to this one. If you find a promo code available online, it is certainly recommended to use it when making use of the promotions on the site. There are also plenty of other promotions available across the site so be sure to look out for these and make the most of them. The mobile gaming network on this site is pretty impressive from iPhones, smartphones or any other mobile system. You can expect to go directly from the registration system to the homepage, letting people play the games they crave sooner. There are plenty more mobile bingo sites which you can see here if you prefer this style of play. There are six levels of membership on this site, ranging from Newbie, to Silver, to Gold and Diamond, and then all the way up to Super VIP. When you play more you’ll get more- more bingo cards and rewards to really give you better rewards and bonuses that you deserve when you’re spending your hard-earned money. Instead of having a flat fee for referring your friends to the gaming network, you get the same bonus as the deposit that they make to play. If you have a friend that consistently deposits a lot of money to play, then Gone Bingo can reap huge rewards for you. During their next 60 days on the site, you can receive 10% of the deposits that they make. “Bingo school” teaches new players how to be successful at the games on the site. Gone Bingo changes their promotions almost monthly to make sure that players always have the best opportunities to win. Most of the promotions they offer fit in with special times of the year. Gone bingo has a lot of different types of games for players to enjoy; including 30 ball, 80 ball, 90 ball, and even 75 ball bingo. Many bingo players that are dedicated to the game obviously like to try different games and mix it up a little bit, so they offer the basic slot, casino and scratch card games to make sure there’s something for you to enjoy. Banking and depositing on this site is simple, because it offers Click2Pay, ClickandBuy, debit cards, Visa cards, Mastercard, UseMyBank, Ukash bingo and Paysafecard. The smallest amount of money that you can withdraw is £50, and it can take up to a week to receive it. Plus, they contend that at least £25 should be deposited before it’s withdrawn, and you get one withdrawal every seven days, and these withdrawals are then processed on Monday or Wednesday. They also have pretty awesome live support. You can send them an email with an on-site form, or even enlist the help of their support team to really get the full benefit. Overall, we would highly recommend the Gone Bingo codes to new players. The site is fun and enjoyable with plenty of games to choose from. They offer a good selection of games and features along with mobile compatibility so you can play on the go. If you enjoyed our Gone Bingo review, be sure to check out the site for yourself and see what’s available!